This photo of the Team Lotus pits at the 1970 British Grand Prix finally reveals what Lotus founder Colin Chapman (background, with stopwatch) meant by performance through lightweight. 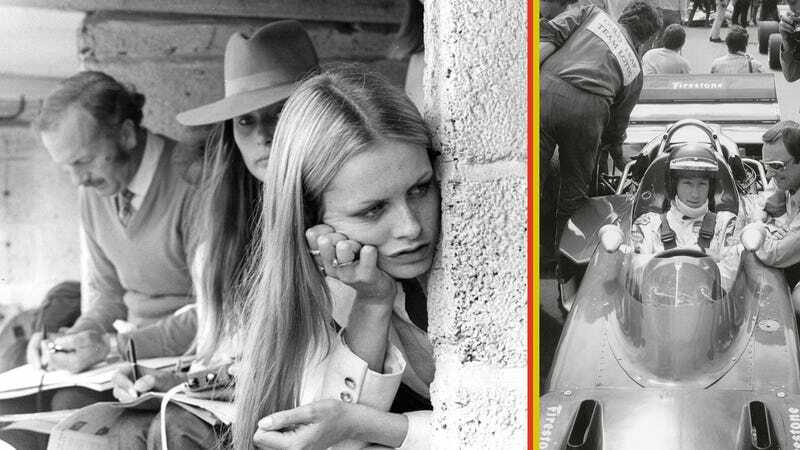 It’s nothing to do with pencil-thin suspension pieces or cross-drilled aluminum parts and all to do with having British supermodel Twiggy (foreground, sullen), who weighed 90 pounds in her modeling days, hang out in the team’s garage as their lucky charm. The androgynous icon of London’s swinging sixties proved to be a good omen for Team Lotus: Jochen Rindt (in Lotus 72C, right) won the race by over half a minute ahead of Jack Brabham, who ran out of fuel on the last lap.